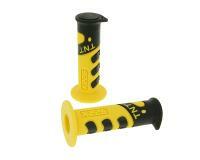 Sporty grips with cool TNT look. The 922X is on a par with the latest generation of grips and is available in many cool colours. The grip has an “up” mark for optimum placement the handlebars. This means they can be easily placed on both sides of the handlebars and are ergonomically perfect.